It’s been a while since I’ve had a break, so I was really looking forward to our second Tri Camp with Embrace Sports. 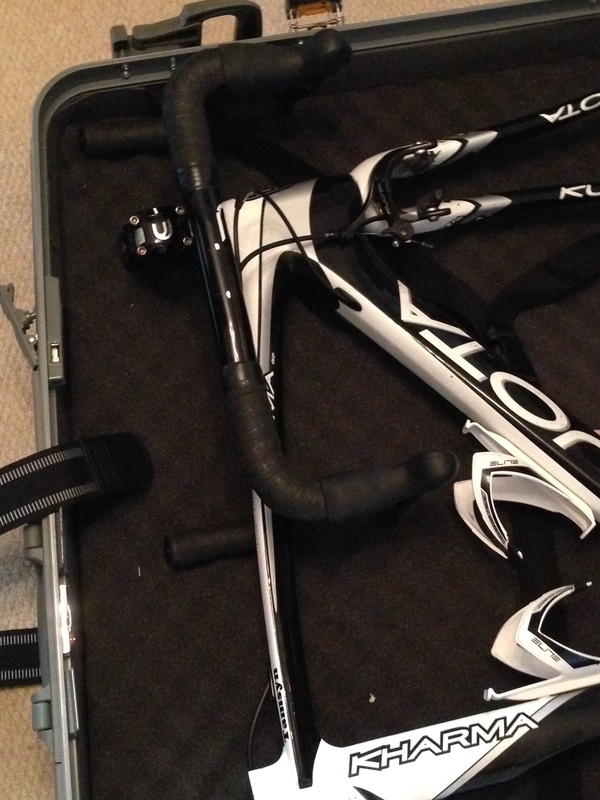 The day before, Tobie from BikeGuy came over to help Stu and I disassemble our bikes and pack them in our cases. As we’ve both had bike fits, we had to mark settings very carefully. You can just about see my handlebar marks on the image below. After packing our cases, we travelled up to Gatwick. We had decided to spend the night at a hotel there before getting an early flight the next day. We arrived at the airport quite early. After checking in our oversized cases, we ate breakfast before heading to the departure lounge. I was busy answering work emails, when Stu noticed a girl carrying an Ironman branded rucksack chatting to a sporty looking guy. He guessed that they might be on our holiday, so he went over and spoke to them. Stu’s guess was correct: Bernadette and Jose were also going to be on our holiday. After a short flight to Toulouse, we gathered our luggage and headed towards the meeting point where Neil and Graeme were waiting for us. Poppy, who we know from our last triathlon holiday, was also there. We then headed to the minibuses for the 90-minute drive to the farmhouse. Stu ended up in the newer minibus whereas I was in ‘Van Rouge’ with Bernadette, Lou, Elena, Alex and Jose. 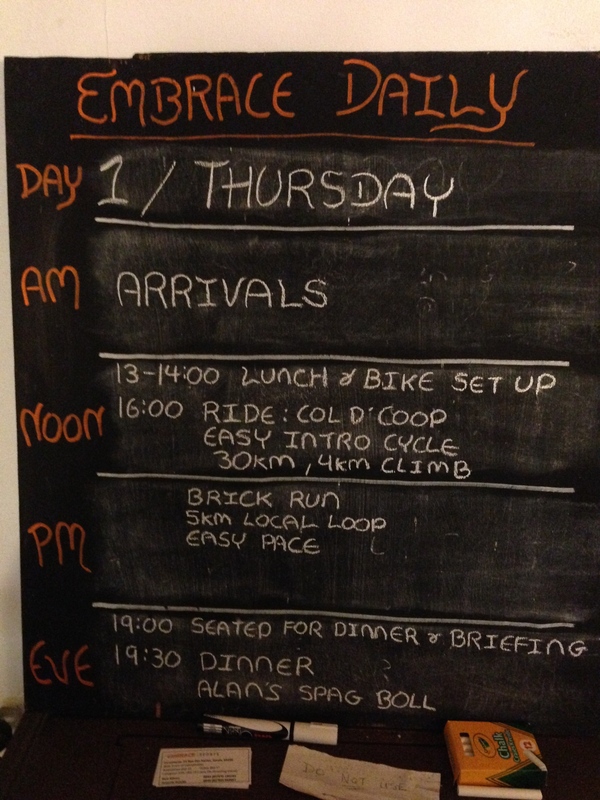 …as well as the more detailed plan for the day. After eating, we all headed out to a covered area to set up our bikes. I managed to put most of my bike together, but I needed a little help from Stu to attach the back wheel. I then got Graeme to have a look at my bike. He swiftly realised that I had failed to tighten almost every part sufficiently. Graeme got out his torque wrench and sorted everything out for me. As soon as we got back to the farm-house, we went out for a 5km brick run. I didn’t quite manage to maintain the pace I had hoped to keep up, but it wasn’t too bad. When I got back, there was time for a shower and some photos of the beautiful scenery before Alan served his spaghetti Bolognese. Overall, it was a fantastic first day. After the early start, I felt exhausted and was grateful to get into bed! I’m a Challenge Weymouth winner!